Did you know we pick up donations? Each day we send out two box trucks in the DC area to pick up items donated by residents, contractors, and businesses. You may not see our truck crews around the warehouse, but you’ve definitely seen the results of their work: About half of our incoming donations are received and transported by them. Scheduled by our in-office Donations Team, most of what our crews collect are the items too big or numerous for folks to lift and transport on their own. 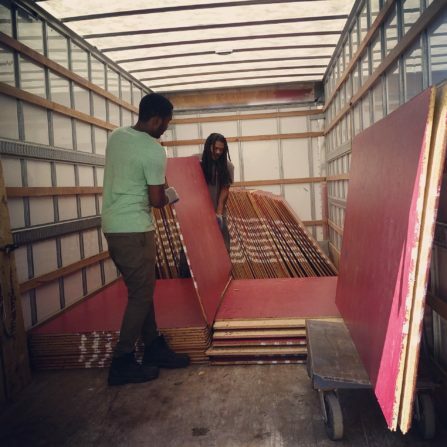 Truck crew members Nordaine and Chris unload subflooring donated by the National Building Musuem. Small business owners especially appreciate this service. When they have surplus inventory or leftovers from renovations, it costs them a great deal to rent dumpsters or pay fees at the landfill or incinerator. When we come pick up their materials, not only do they avoid disposal costs but they can receive tax deductions – and for these mom & pop shops, every little savings helps them survive and thrive. It’s a winning situation for the local economy and environment! 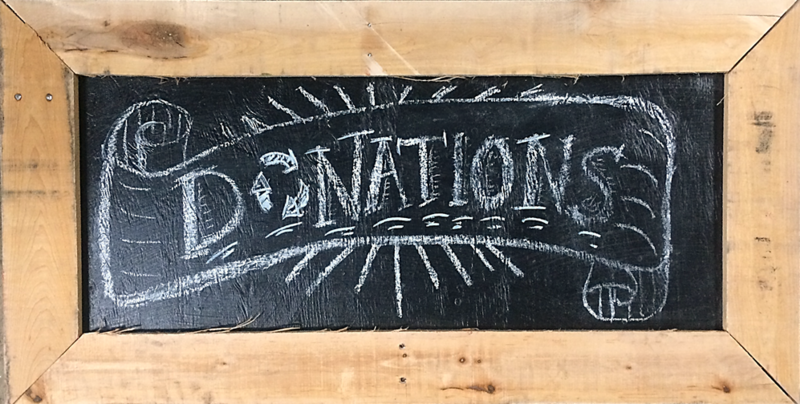 Everyone from granite fabricators and tile suppliers to restauranteurs and local hardware stores are able to save money by donating. Reducing the waste stream eases the pressure on local governments to spend tax revenues on new incinerators & landfills. Then all that reusable material arrives at our warehouse, making repairs more affordable for everyone. If you have reusable materials and would like to schedule a pick up, please review our Donations Guidelines and fill out the request form on our site: www.CommunityForklift.org/PickUp. 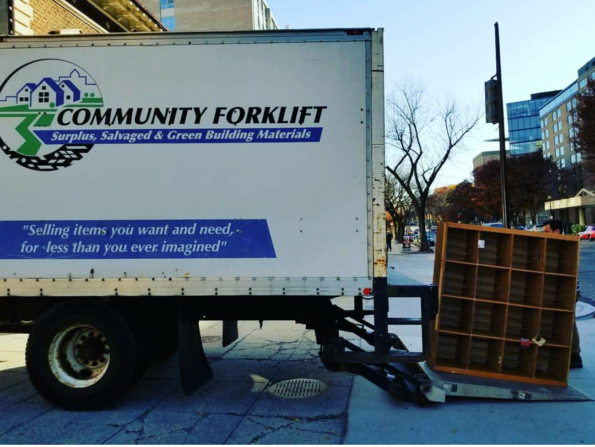 Although we cannot schedule pick ups by email, if you have a question about your specific items, the quickest way to reach our Donations Team is by emailing Donations@CommunityForklift.org (if necessary, you can also call our Donations Coordinator at 301-832-0781). The Donations team is in the office Monday-Friday 8am-4pm. We are not able to respond to phone calls, texts, emails, and online forms outside of these hours. 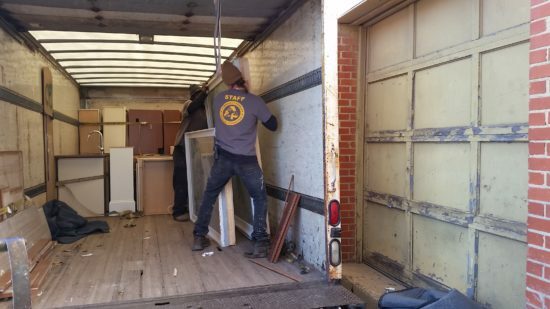 Floor Team members Neo and Gilbert unload windows donated by a local resident. Thanks to generous folks around the DC region, we always have a steady stream of donation offers. We work hard to keep up so these great items don’t go to waste, but picking up donations is one of our biggest expenses. In fact, one of our two trucks died recently, and we have to use a very expensive leased truck until we can raise enough money to replace it! Please help us stay on the road by making a donation. Each financial gift, large or small, helps us fulfill our mission to lift up communities through reuse.